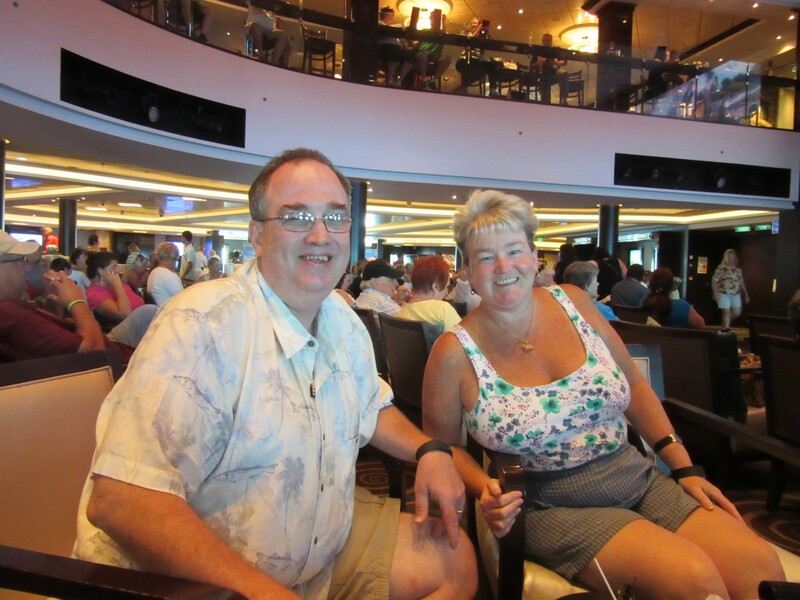 October 25, 2015 (by Jimmy) – In Sea and Do for Two Part One, Angela gave you a tour of the ship. I want to provide you with an idea of what our adventure on the ship entailed. 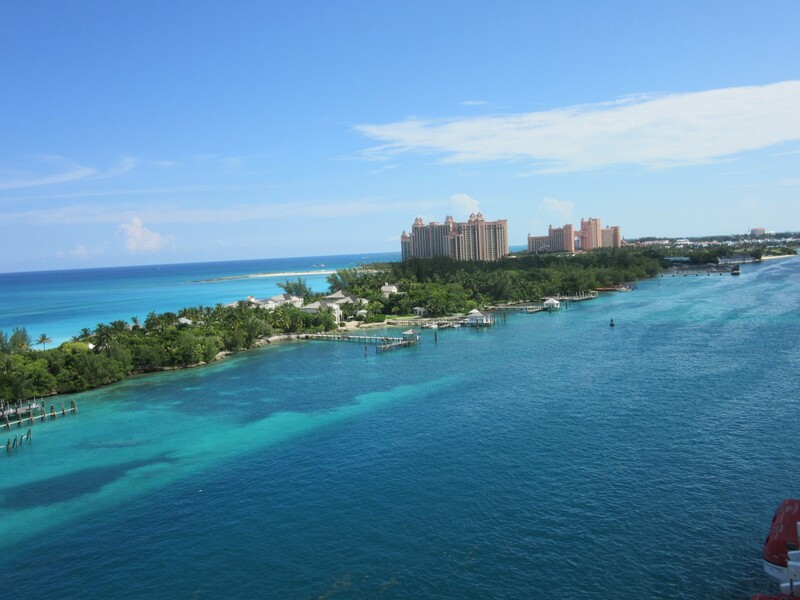 Most people think of cruising in terms of the places you go. This cruise we went to St. Thomas USVI, Tortola BVI, and Nassau Bahamas. The thing about travel (whether in an RV, plane, train, bus, or ship) is that you have to get there first. For me, the enjoyment of travel is the journey itself, especially when I travel with Angela. We have memories that only she and I share because of the decisions that have to be made, the people we meet along the way, and the funny things we say or do on the journey. Our day normally began by reviewing the Daily Activity Guide that Norwegian Cruise Line (NCL) puts out to share what is happening on the ship in each 24-hour period, Angela and I would take the activities list (Angela made sure we had one for each of us) and identify the things we definitely wanted to do and potentially wanted to do if there was time or if something should change. She and I would compare our choices and see which things we both wanted to do and those that were on only her list or mine. 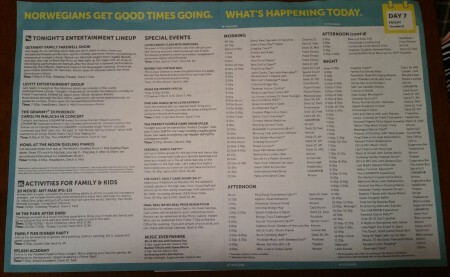 Armed with this information, Angela and I would then plan our day. It was not unusual for one or the other of us to say, “I’m going to do this or that, and I’ll meet up with you at dinner” (or some other event). Also, as a part of our planning, she and I would decide when and where lunch and supper would be, and then we were off. There were two things Angela and I tried to get on our activities list each day. 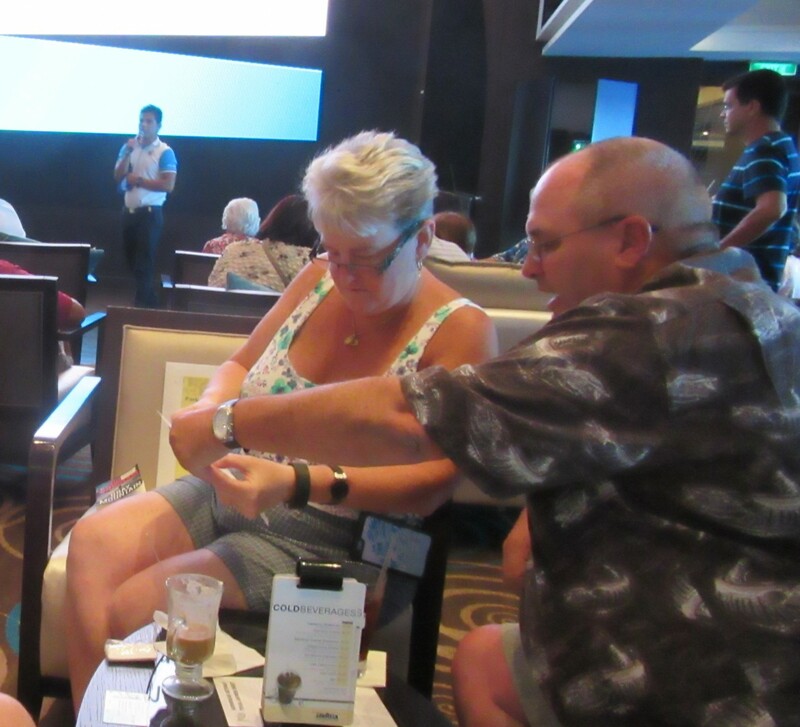 First, a number of different shows are available, and we enjoy an evening show whether we are on a ship or at home. Second, I am a big trivia buff, and Angela loves to test herself in the absurd fact arts herself, so we always tried to hook up at the Trivia Games, which happened about four times a day. 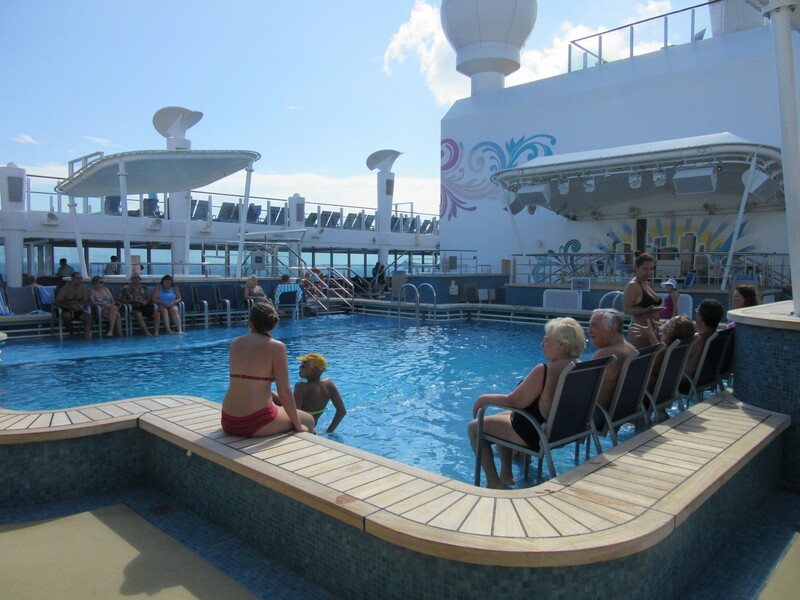 Between, trivia, shows, on-deck activities, reading, eating, and visiting, we found we had no problem filling every day. Here are some of the things we did. It’s better to have another couple or two with whom to play trivia because up to six people can be on a team; different experiences provide for answers you alone wouldn’t know. We met a couple from New York (Eric and Evelyn) who would show up at every trivia with us, and we became team TENNYORK. There were general knowledge trivia games and specialty trivia games. The specialties ranged from Movie Tunes, at which we did well, to Money From Around the World to Super Hero’s (in which we were extremely clueless). Twenty questions were provided, and whichever team had the most correct answers won a small prize. 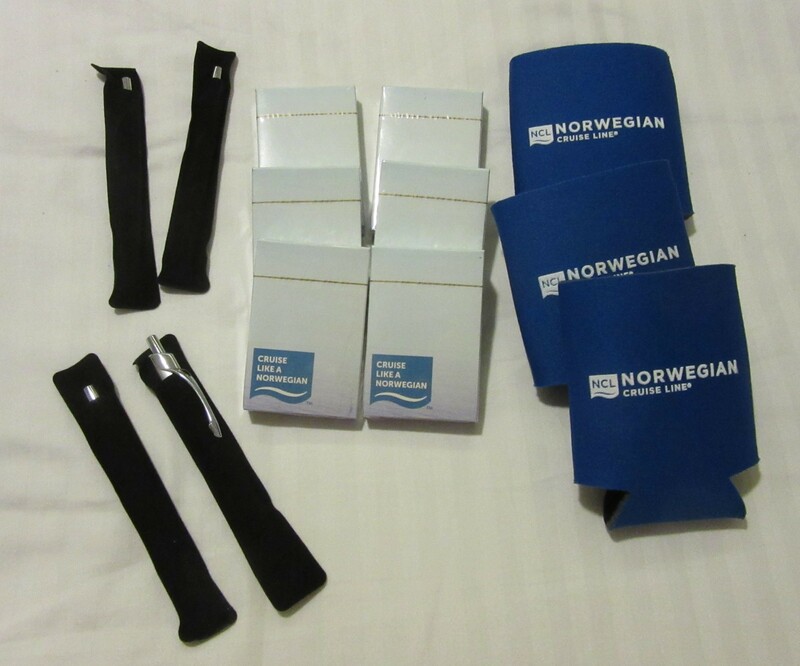 Angela and I won four pens, six deck of cards, and three can holders. That’s a 25-30 percent win rate. At the bottom of this colorful staircase is a venue called Headliners. 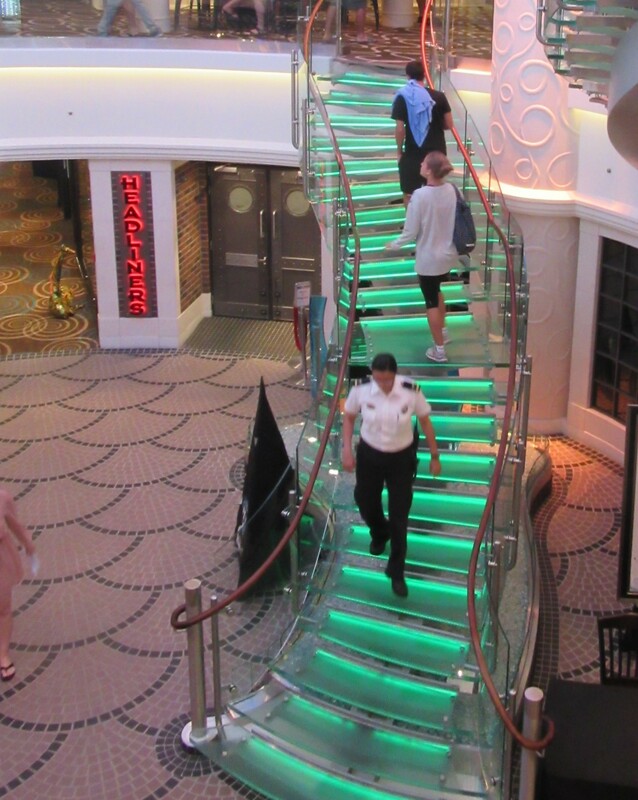 There were two stand-up comedians on this cruise, and we saw both. 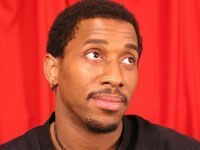 Frank Townsend and Clinton Jackson were hilarious. There were two main stage shows in the big theater. One was the stage presentation of Legally Blonde, and the other was a dance show appropriately called Burn the Floor. Legally Blonde was entertaining other than the lady that played Elle was closer to 40 than college age but as Angela says you must have a willing suspension of disbelief, so I let it go. Ok, I blogged about it then let it go. “Burn the Floor” (what I affectionately called Stomp the Burning Stage – and others such titles just to get Angela riled up) was exceptional. It was an hour and a half of non-stop Dancing with the Stars but without celebrities, and everyone was dancing as hard as they possibly could. Half an hour into it, I felt like I had a workout just watching them. By far, this was my favorite show of the cruise. There were other parties, movies, and such around the ship. 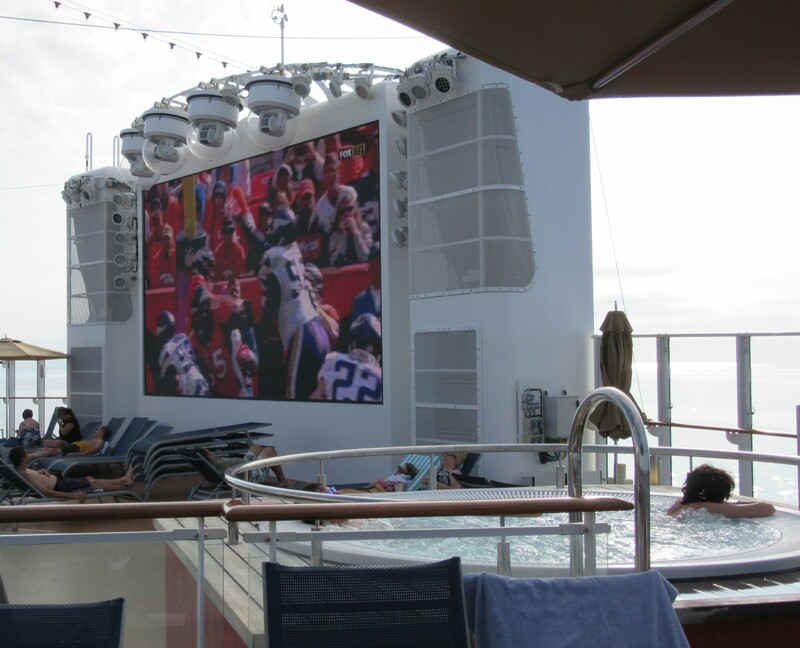 There were sporting events shown on a big screen on one of the upper decks at the back (aft) of the boat. I think it would be pretty cool to watch a football game in a hot tub drinking a margarita. 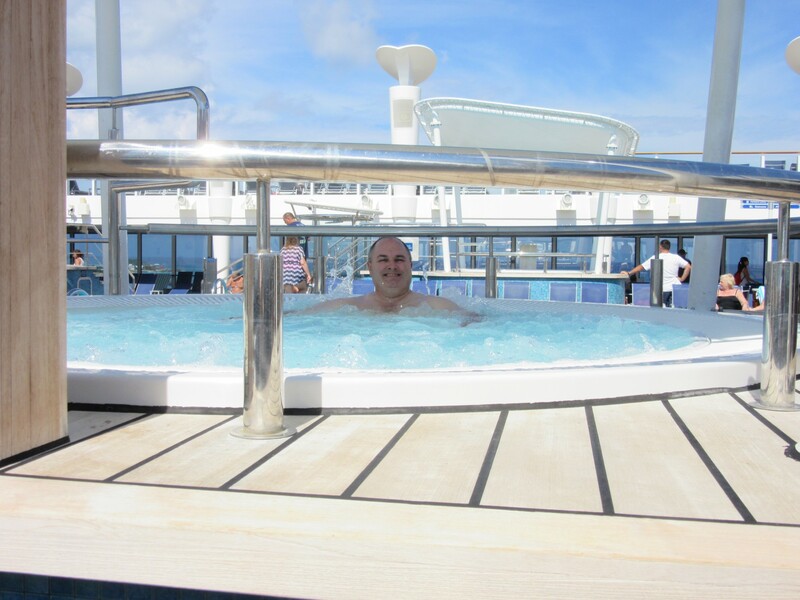 Watching football from a Hot Tub in the Caribbean with a Margarita – Priceless! 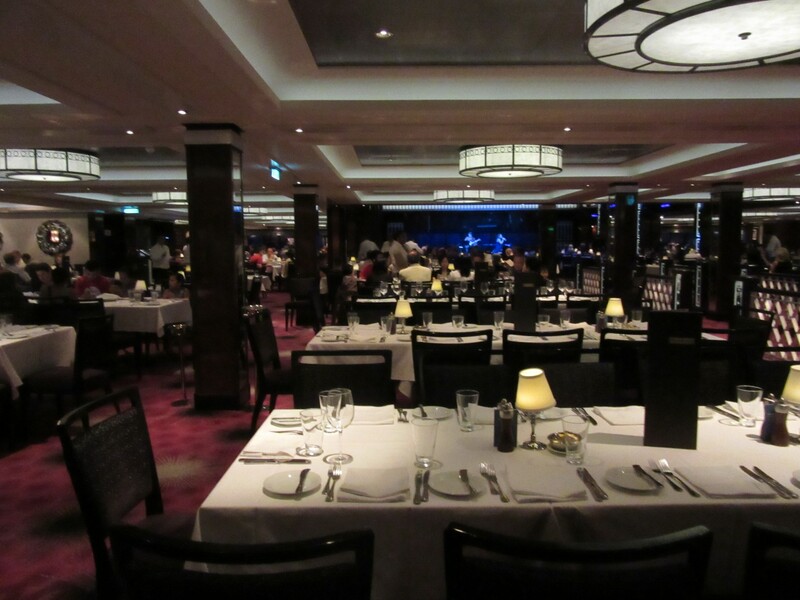 Part of the benefits of cruising is that the food is included in the price of the cruise. Now there are ample free restaurants from which to choose, but there are specialty restaurants in which you pay extra to eat. Angela and I stay strictly to the free restaurants. The free restaurants include a buffet, where almost all the kids go (we stay away from that unless we want a snack of some sort). 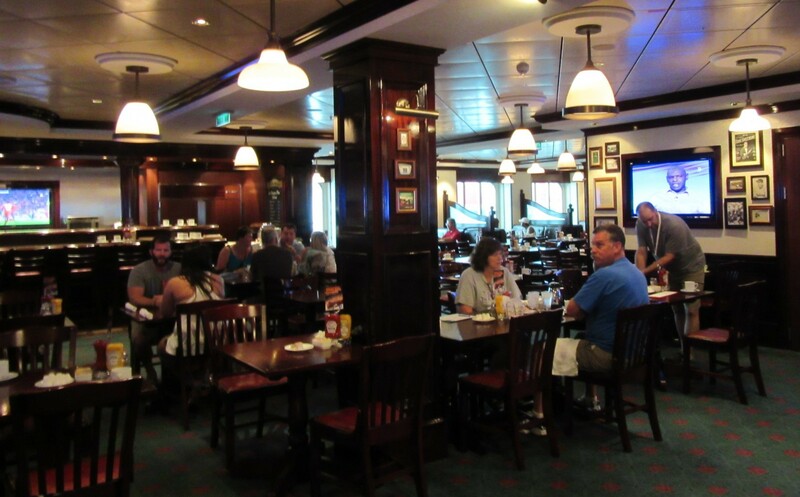 There’s a smaller bar/eaterie called O’Sheehans where we would have breakfast and make our plans for the day. 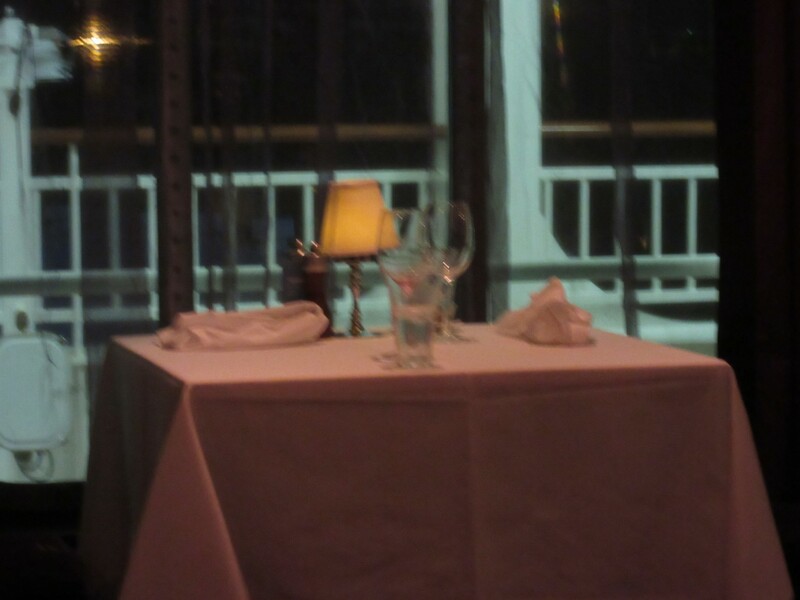 There were a couple of smaller (more intimate) restaurants – one called Taste the other called Savor. When we wanted a quiet meal and the ability to visit with one another, we chose one of these venues. The final free restaurant was called Tropicana. It was larger and had a stage in the middle where a band played and sometimes the dancers from the “Burn the House Down” (one of my many names for the show) would dance. The Tropicana, Savor, and Taste were all classy places ,and you felt like this is the way all nice restaurants should be. 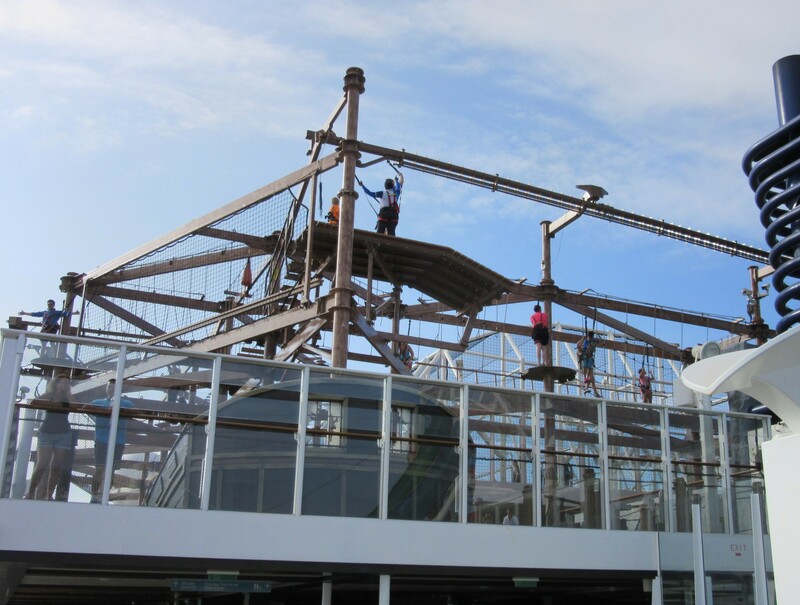 On the upper decks there were various and numerous activities available. 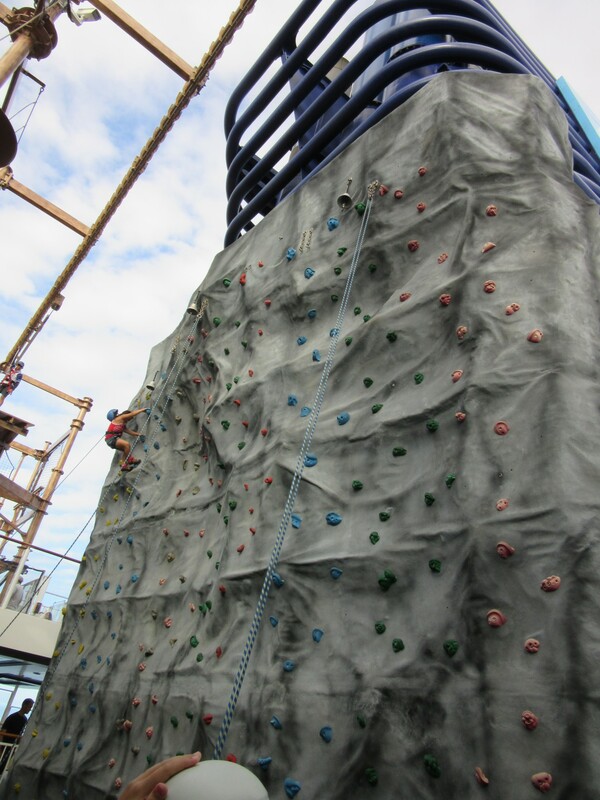 There was a climbing wall, rope climbing, a zip line, and even a plank to walk off the side of the ship. We did none of these. There were water slides, even a couple where the floor drops out from underneath you. Yes, I did do these (yes, even the one where the floor drops). Most of our on deck activities centered around relaxing in a lounger, listening to music, reading a book, and (in my case) looking for “cleave”land. 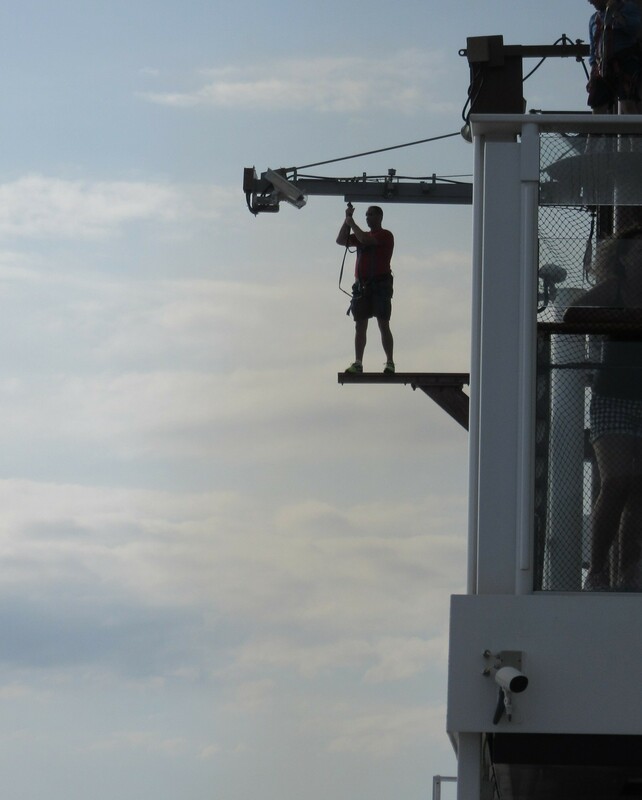 Walking the Plank – about 12-15 stories above the water. 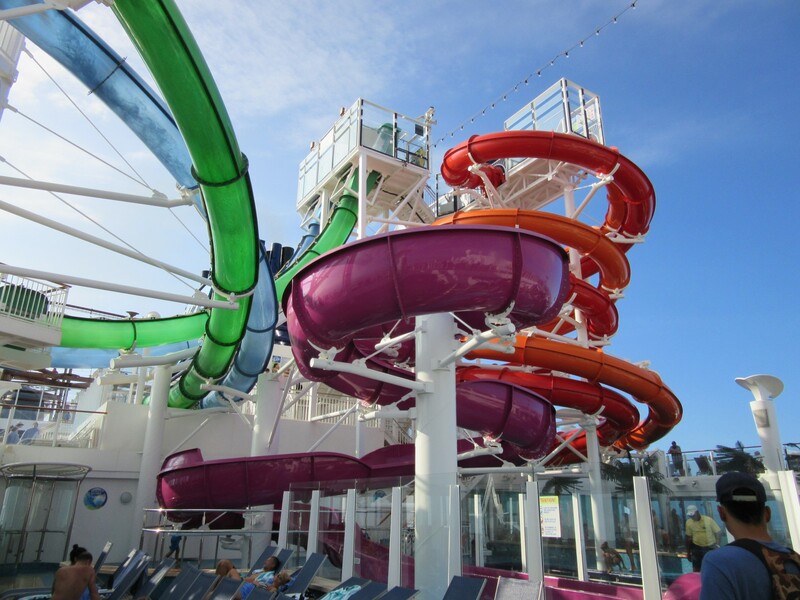 Water Slides – I rode the green one. Notice at the start you get in vertically, and the floor drops out from under you. So the journey was full of activities, food, relaxation, people watching, games, reading, and just being with my beautiful wife. 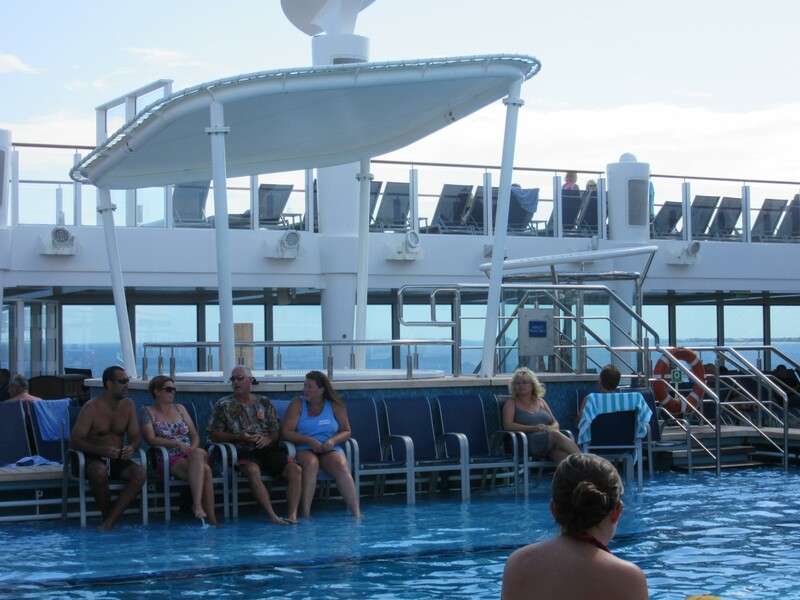 These are the things we did on the ship; there was always something to do and enjoy. 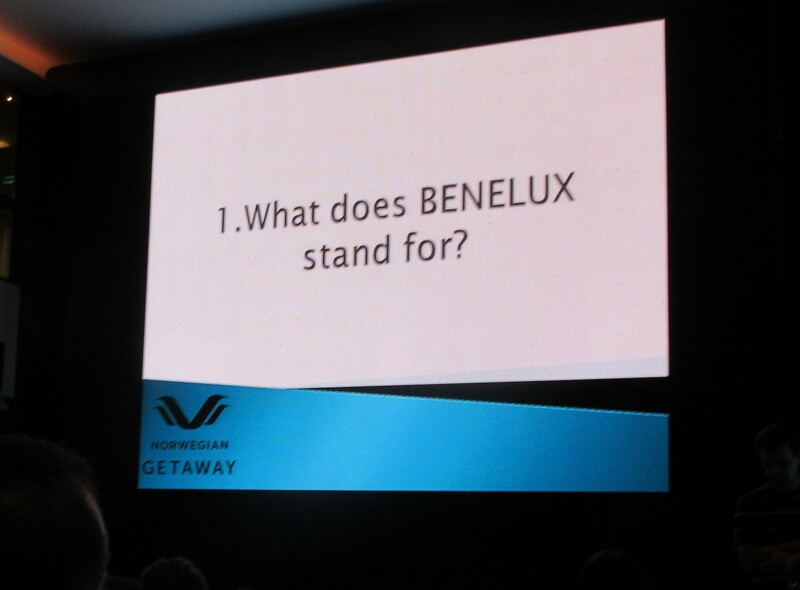 By the way the question above “What does BENELUX stand for”. BENELUX stands for Belgium, the Netherlands, and Luxembourg. If you didn’t get it right don’t worry, we didn’t either.